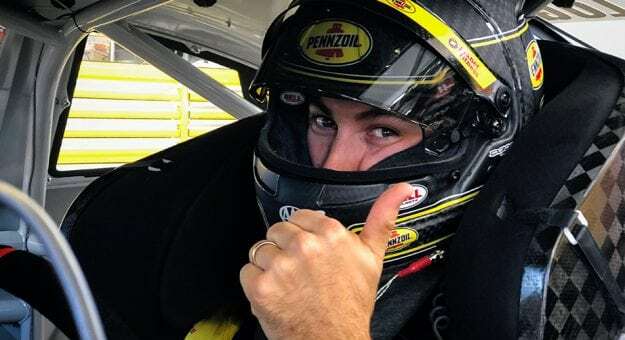 Joey Logano topped the opening Monster Energy NASCAR Cup Series practice session from Las Vegas Motor Speedway ahead of Sunday’s South Point 400 (3 p.m. ET on NBCSN/NBC Sports App, PRN, SiriusXM NASCAR Radio). The Las Vegas race is the first of the 10-race postseason for the sport’s top series. Logano led the way with a fast lap of 189.653 mph around the 1.5-mile track in his No. 22 Team Penske Ford. Based on average finish, Las Vegas is Logano’s best track with a 9.7 mark in 10 career Cup starts. Playoff drivers were all over the top 10 on the speed chart, occupying nine of the top 10 spots. Stewart-Haas Racing teammates Kevin Harvick (second, 189.460 mph), Aric Almirola (third, 188.864 mph) and Kurt Busch (fifth, 188.140 mph) were all in the top five. Erik Jones was the lone non-Ford in the top five as he placed fourth (188.640 mph). A trio of Toyotas occupied sixth through eighth on the board in Kyle Busch, Denny Hamlin and Martin Truex Jr. Clint Bowyer, the fourth of the SHR playoff cars, was ninth. Among the playoff drivers, Jimmie Johnson came in last on the board in 21st place. The top non-playoff driver in the session was Jamie McMurray (10th) followed by Ryan Newman (11th). Several teams had to serve practice holds in the 50-minute session. The No. 3 Richard Childress Racing Chevrolet team of Austin Dillon and the No. 7 Premium Motorsports Chevrolet team of Reed Sorenson each served 15-minute holds for failing pre-race inspection twice at Darlington and Bristol, respectively. The No. 15 Premium Motorsports Chevrolet team of Ross Chastain (missed rookie meeting), No. 42 Chip Ganassi Racing Chevrolet team of Kyle Larson (late to inspection) and the No. 51 Rick Ware Racing Ford team of B.J. McLeod (late to inspection) all served 15-minute holds as well. The No. 19 Joe Gibbs Racing Toyota team of Daniel Suarez and the No. 78 Furniture Row Racing Toyota team of Martin Truex Jr. each served 30-minute practice holds due to failing pre-race inspection three or more times at Indianapolis. The Monster Energy Series will be back on track for Busch Pole Qualifying at 7:30 p.m. ET on NBCSN/NBC Sports App.